East of Markarth and southwest of Rorikstead. Old Hroldan Inn is a remote inn in The Reach where Tiber Septim once stayed. It is operated by Eydis with the help of her young son Skuli. Eydis claims her husband is fighting in the war, though there appears to be some doubt as to which side he fights for. Leontius Salvius spends all day working outside on various menial tasks, and offers no services. 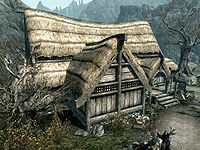 The inn is located to the north of the road from Fort Sungard to Markarth near where the road crosses the Karth River. * Only while The Ghost of Old Hroldan is active. † Becomes innkeeper only if Eydis is dead. Rogatus's Letter: Deliver a letter to a farmer's son. The path to the inn is on your right when traveling from Fort Sungard to Markarth a few paces before you cross the Karth river. Along the path that passes the inn are a couple of tree stumps with mora tapinella fungus growing on them as well as several juniper trees that abound in the region. The path continues past the inn and eventually joins another path that goes from Soljund's Sinkhole to near Rorikstead before petering out. There is a patch of white cap fungus growing to the left of the front porch and a wood chopping block and a grindstone south of the entrance. On the porch to the left of the entrance are three food barrels. The entrance leads directly into the common room, which like most inns in Skyrim has a long fire pit down the middle of the room, five long wooden tables against the side walls and a counter at the far end. There are several barrels containing foodstuffs around the room and three doorways off the main room, two to the northwest and one to the southeast. The tables are laden with a selection of bottles of alto wine and wine, a couple of loaves of bread and either chicken's eggs or pine thrush eggs, except for the table in the western corner which has a couple of salmon steaks and several pieces of cheese instead of the eggs. There is a basket beside the fire pit containing three pieces of firewood. The counter, which is at the northeast end of the room and is where Eydis spends her days, has a bottle of alto wine, a bottle of wine, several pieces of cheese, and a copy of Final Lesson on top, and two more bottles of wine, a small coin purse, an iron war axe, and five loose septims underneath. Behind the counter, along the northeast wall, are a couple of large vats and a set of shelves holding three bottles of alto wine and five bottles of wine, with a pile of firewood to the right. There are several racks hanging from the ceiling in front of the vats and shelves holding a total of eleven rabbits, six pheasants, two garlic braids, a bunch of dried elves ear, and a bunch of dried frost mirriam. Either side of the doorway to the southeast are two sets of shelves holding a total of two bottles of alto wine, six bottles of wine, seven bottles of Nord mead, four loaves of bread, and three bunches of elves ear. The large bedroom to the southeast is Tiber Septim's room, and is where Eydis claims Tiber Septim slept on his first night after liberating Old Hroldan from the Witchmen of High Rock. The battle is famous for being where Hjalti Early-Beard (later Tiber Septim) earned the name Talos Stormcrown, when he used the Thu'um to break the settlement's defenses. Eydis will rent you the room for 10 septims a day. The room is the one to the southeast, and contains a large double bed by the southeast wall with an end table on either side, one of which has a copy of the Two-handed skill book Battle of Sancre Tor on top, while the other has a bottle of wine on top. There is also an unlocked chest at the foot of the bed, a long unlocked chest against the southwest wall, and a kettle in the southern corner containing a copy of Killing - Before You're Killed. In the western corner, along the northwest wall, is an owned single bed. The first time you sleep in this room will initiate the quest to help an ancient ghost. Opposite the Tiber Septim room are two more smaller bedrooms. The bedroom to the left contains an owned single bed in the southwestern corner with a round wooden table and chair beside it and a novice-locked chest at the foot of the bed, with a tall wardrobe containing clothes against the northwest wall. On the table is a bottle of Black-Briar mead and a copy of Olaf and the Dragon. The bedroom to the right contains an owned single bed in the northeastern corner with a round wooden table and chair beside it, a novice-locked chest at the foot of the bed, and a dresser against the northeast wall. There is a copy of Horker Attacks on the table. If you take the path to the north into the mountains it'll lead towards the village of Rorikstead. Along the way you'll encounter a small camp with the lovers Karan and Talvur. Unfortunately, they've been killed (possibly by the predator nearby), but Karan's Journal indicates that they have a stash hidden right nearby in a stump. Later, a Shrine of Mara can be found here. This page was last modified on 14 April 2019, at 06:07.